Kevin Durant has lead the Thunder to two straight victories against the Lakers in the 1st Round of the NBA Playoffs. 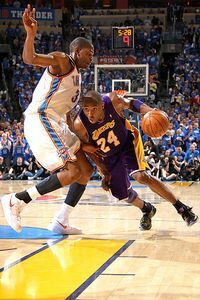 In those two games, Durant is averaging 26 pts and 12 rebs and has a game winner over Kobe Bryant. That being said, as good as Durant is playing on the offensive end he is playing even better on the defensive end. He has done a great job the whole series rebounding the ball, but his 4th quarter defense on Kobe the last two games is nothing short of incredible. To read more on Durant's defense the past two games click HERE. The night before the NBA Draft, when many of the soon to be lottery picks were probably hanging out with friends and family, eating, partying and having fun, Kevin Durant was doing just the opposite. Durant called one of the assistant coaches at Texas and asked if he would rebound for him so he could get up some jumpers. Now shooting more jumpers that night isn't what has helped Durant the past two games, but it's the work ethic and the passion that KD showed that night that continues to make him a better player.